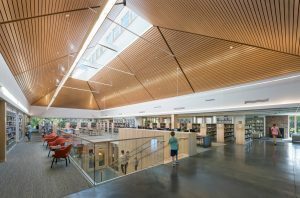 In May 2018, the Massachusetts Library System hosted the Research Institute for Public Libraries. Fifty librarians attended the institute with the goal of building research into their activities. Interested to learn more about how the institute has benefitted our members this past year, I reached out to Jessi Finnie, the Director of the Scituate Town Library. In this interview, Jessi will tell you about how she integrated what she learned at RIPL into her workflow and strategic planning process. Jessi Finnie opening the doors at the Scituate Town Library grand opening. Reflecting on the Research Institute for Public Libraries (RIPL), what did you think about your experience? 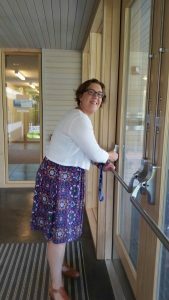 Jessi Finnie: Overall, I was pleased with my experience at RIPL and left with more tools in my tool belt to manage our library’s Strategic Planning process. What are the most useful tools and resources you learned about at the RIPL? While I already knew how to pull census data, RIPL highlighted tools within FactFinder such as using the advanced search feature to compare data between towns. We also learned of a number of smaller and more niche databases that could provide helpful data such as “Kid’s Count” and some of the information to be found from the Centers for Disease Control. Learning about new resources is always helpful, but one of my biggest takeaways from the session was simplifying and maximizing my presentation data. We discussed the pros and cons of various types of charts and graphs, and learned a bit about how people respond to these visual tools. I think data analysis comes naturally to many librarians, but presenting data in an impactful way can be a bit more challenging. Having recently submitted your strategic plan to the MBLC, how did the RIPL help you with the process? RIPL helped me with many aspects of strategic planning, but the biggest impact was a general improvement in my confidence and enthusiasm for the planning process. I was able to answer some difficult questions I’d been pondering regarding that process by discussing with presenters and colleagues. I was able to identify some new tools and resources for both finding and analyzing data. Another big hurdle for me in the strategic planning process was getting over my feelings of being bothersome when approaching patrons for one-on-one interviews. Talking out some of my concerns allowed me to see these conversations as an opportunity rather than an intrusion. Have you gained confidence and skill in building evaluation info your workflow? I believe the tools gained during RIPL have allowed me to work with and consider data even more effectively than before. I utilized many of the skills gained during this workshop during the library’s strategic planning process, but those skills will continue to help as we work to meet the plan’s goals and objectives and continually evaluate the effectiveness of the plan. I think RIPL would be most impactful for those who are involved in or about to embark on a planning process. RIPL really seems geared towards working through specific problems and concerns, so knowing ahead of time what you’re “stuck” on and discussing it in this group setting can be very beneficial. Taking some time to think through your project and its potential pitfalls is a worthwhile exercise prior to attending the conference. Note from Michelle: Are you preparing for your strategic planning process? Then, make sure to register to attend upcoming MLS Strategic Planning workshops offered at six locations throughout Massachusetts. This entry was posted in Community Engagement, Miscellaneous by Michelle Eberle. Bookmark the permalink.